Conferences and strategy groups are a HUGE chance for you to build your reader's and writer's confidence. 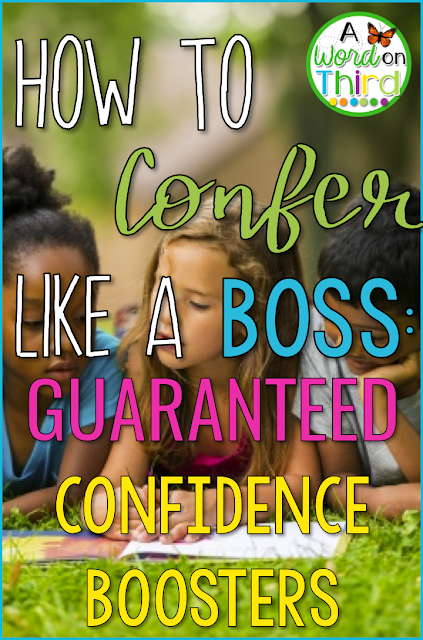 Here are my favorite ways to build confidence within my students during my workshop period! These are super simple, and they are my favorite way to gather data quickly! I can sometimes meet with every single student for a compliment conference in a single class period. Even if you can only meet with half of the class, that's STILL really quick! In a compliment conference, you ask the student to read or look at his/her writing. After jotting down a few notes, you just give the student a compliment and leave. It should take 1-3 minutes. Literally all you are doing is researching and complimenting. Remember to make the compliment about the student instead of about you. For example, instead of saying, "I like how you...," you might say, "You did what strong readers do when you..."
When you watch the kids, you can jot down all of the possible next steps you see. While this is going to get you a lot of data quickly, it's still not a waste; you're positively reinforcing academic skills. The table conference starts out like a compliment conference. After complimenting the child you're conferring with, get the attention of all the other students sitting at that table (or in the immediate area). "Readers, give me your attention for a moment! While I was reading with David, he stopped and thought when something didn't make sense. When he couldn't figure it out, he reread that part. He made sure not to go ahead when something was confusing to him, which is something strong readers do. When I read with you in a moment, I want to see you do that if you get to a confusing part. Okay, get back to work!" Then, you'll meet with each of those readers one-on-one and ask them to practice that skill if it applies. All the while, you can gather data quickly on those students. I basically look at the table conference as a slightly slower way of gathering data than the compliment conference, but it allows me to give my students a chance to practice an important skill. The child who gets complimented for the table conference is so excited to be considered an expert at a skill. I like to make sure that everyone gets the chance to be considered the expert, so I track this in my notes! The mid-workshop interruption is simply a super quick teaching moment in the middle of independent work. Sometimes I gather my students at the carpet, but sometimes I just have them stay where they are and give me their attention. I like to highlight things that happened during conferences from time to time, but I always ask for the students' permission first. Again, students are viewed as experts, and this helps to boost their confidence. Shares are the closure part of workshop periods, and they usually last 5 to 10 minutes. I often use shares as a chance to highlight good work during small groups and conferences, just like I do in a mid-workshop interruption. If I ask a student to share about a reading strategy they used that helped them, a response they wrote to a book, or a piece of writing, I'll always ask students to give a compliment. Being complimented by peers sometimes feels way better than being complimented by your teacher. One of my last but favorite ways to boost my students' confidence is to highlight them in my anchor charts. I got this brilliant idea from the book Smarter Charts, which you REALLY need to get if you don't have it already!! This practical book really changed my workshop teaching, and it was so easy to implement the strategies I learned from it! Let's say I've got a chart that highlights ways to elaborate in writing. Each paper I put on my chart highlights a different strategy, like the one in the picture below (which is actually from the blog of the authors of that book). On each part of the chart, I will add an example of that skill that I find when I confer with writers. I collect the student writing at the end of the period (with permission, of course), make a copy, and put it on the chart. Students can use that writing as a mentor. I don't need to explain all the ways that boosts confidence! Another great way to highlight fabulous work and boost confidence is by recording things in your classroom. For example, I might record partners working together effectively and show it to the class during the share portion of the lesson. Before students watch video clips, I ask them to think about what makes the video so good. So, if I've recorded partners working together, I might ask, "What is this partnership doing that makes them work together so well?" Now we've got a mini-inquiry going that teaches the rest of the students, while positively reinforcing the student models! What are your secrets for building student confidence? Comment below! 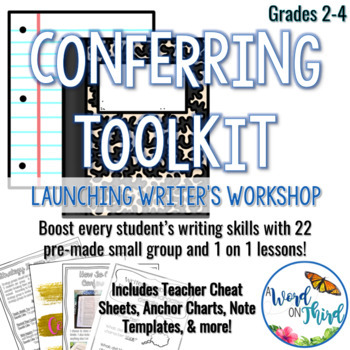 If you’re interested in grabbing my conferring toolkit to help you launch writer’s workshop, you can download it HERE or by clicking the picture below. There are tons of partnership lessons included. After teaching those lessons, it would make for some great video clip mini inquiries to boost confidence!